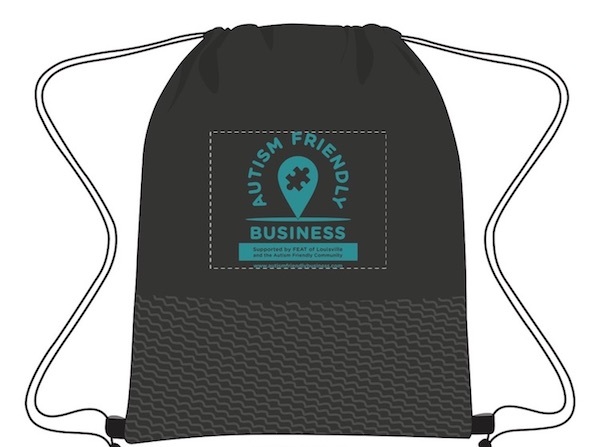 Thank you for your consideration to become a Level 2 Autism Friendly Business! To reach this level, you must provide on our AFBI Facebook page, photos of your business (suggested photos are listed on our website) and choose one of the other options. If you are here, then for your 2nd item, you are choosing to provide Sensory Friendly Bags that your clients/customers may "check-out" or borrow from you while they are in your business. The items contained within this drawstring cinch sack include noise canceling headphones (which we would suggest cleansing each time they are returned with disposable alcohol pads or cotton balls and rubbin alcohol), a small fidget toy, H20 Tubes, spikey balls, emotion cards and stress balls. These are items that could benefit a child. teen or adult while they are on your premises to either calm, soothe or distract. If you have additional questions about these items please contact us at AFBI@featoflouisville.org. Thank you again for your continued partnership! Your generous donations help us to continue offering this life changing program to our community for Free.